When Aubree Stewart answers her cell phone on the way to work one day, she isn’t prepared for her life to change. Someone dialed a wrong number, a simple mistake. But the call changes everything when Aubree overhears information about the murder of a government official. Now she must run for her life as the caller tries to eliminate her. Aubree is placed in the witness protection program, but when the FBI’s protection fails, she heads out on her own. She soon realizes she’ll never stop running until she can solve the mystery behind the wrong number. Unable to trust anyone but herself, she’s cautious about accepting the help of a Park Ranger named Wyatt Erickson. As she struggles to keep herself hidden from the enemy, she finds it harder to protect her heart. 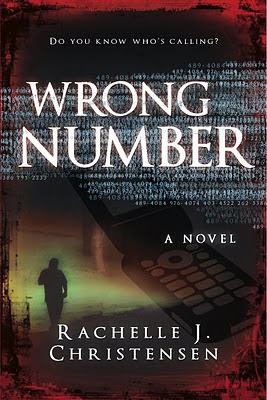 Teeming with government plots, a dash of romance, and plenty of intrigue, Rachelle J. Christensen’s Wrong Number will have your heart pounding the next time the phone rings! For a sneak peek of the first chapter of Wrong Number, click here. I was instantly pulled into Aubree's life and felt a great deal of compassion for her. She answers a phone call, it seems fishy so she calls the police, and then her life is tossed out the window. This book really hit me hard because Aubree was expecting her first baby. I can't imagine being in the witness protection program pregnant and then with a newborn. I loved the different settings in this book, especially when Aubree came to Bear Lake, Utah where we often vacation. The author does a very good job of describing the setting and making you feel a part of the story. I made one mistake in reading Wrong Number. I fell in love with the wrong hero. This was not the author's fault, I take complete blame for my misdirection. I'm going to have to read the book again and fall in love with the right guy. If you're looking for a great suspense novel with a very interesting premise, I'd recommend you read Wrong Number. Love this review!! This is my kind of book! Cami, thanks so much for the awesome review! I smiled when I read about your attraction to the "wrong hero". I think you'll be happy to know he's one of the main characters in my next book. Shh, we can't say too much, but had to tell you that! It was so great to see you on Saturday, hope you're doing well. Oh, thank you, Rachelle. I didn't want to reveal who the wrong hero was, but I really loved him! Can't wait to read about him in the next one. Thanks for including me in the blog tour. It was wonderful to see you Saturday also. Thanks for driving all the way to Logan.